RISING SUN, Ind. -- It's a hot Tuesday morning when Paul Strasser pulls up a gravel driveway in a golf cart. He parks as his team -- mostly interns and recent college graduates -- jumps off the back and enters a combined office/kitchen area, where they're greeted by a gust of air conditioning. Strasser and an employee pick up a plastic dog crate from the floor with a towel draped over it. They place it on a table as Strasser slowly pulls the towel back. "Hey, there little baby. It's OK," he says in a soft voice. WATCH ABOVE | Go behind the scenes at The Red Wolf Sanctuary in the video above. A small furry creature cautiously approaches the front of the cage and starts gnawing on the grated door. The baby female fox had been subsiding on Taco Bell meat for the last week, a rescue group that dropped her off had told them. So Strasser's team gets to work, gathering medicine, food and water. 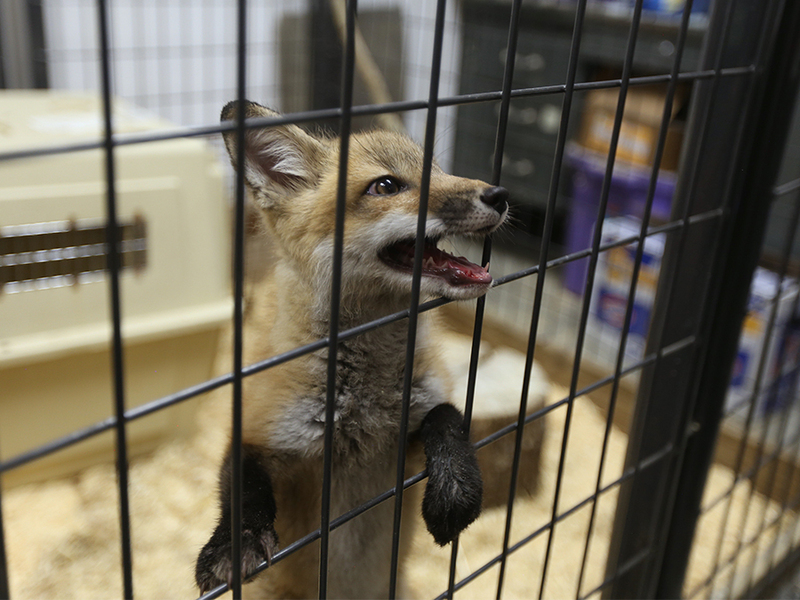 The staff moves her out of the crate into an indoor enclosure where they can carefully monitor her health. It's only the beginning of the week, but this is a typical work day for Strasser. Located about an hour outside of Cincinnati, The Red Wolf Sanctuary is a nonprofit rehabilitation center that provides care and habitats for a range of animals. From dogs and cats to bald eagles and bears, these animals all have a back story and were otherwise destined for death. "There's absolutely nothing cuter than a baby animal," Strasser says. "Can you imagine how adorable a baby bear is? Unfortunately, they grow up and most people aren't equipped to deal with an adult animal, so they dump them." Some are hit by cars, some are displaced by deforestation, some are kept as pets. Strasser receives calls and emails almost daily about animals in need. While he's not able to help every time due to limited funds and state regulations, he says he considers this work a calling. 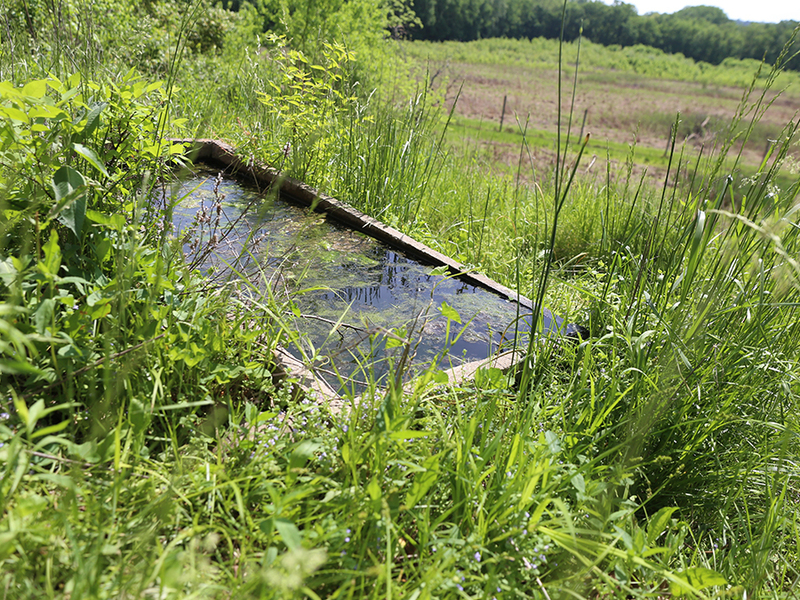 When Strasser was a child, he says it wasn't unusual to find bluegill fish or snapping turtles in the bathtub. As far as his mother was concerned, the woods were her children's classroom. "(Red Wolf Sanctuary) wouldn't exist if it wasn't for her passion," Strasser says. When he was in college, Strasser's mother gave him a copy of a National Geographic book that he says changed the course of his life. The chapter "We are going to lose a few" outlined species slated for extinction in North America. It included the Californian condor, ivory billed woodpecker, black footed ferret and the red wolf. It was the first time Strasser heard about this wolf species and it sparked a fascination. Little did he know years later he would be caring for a pack of them on his own. He earned a degree in fish and wildlife management in Montana and gained hands-on experience at the Cincinnati Zoo & Botanical Garden, where he worked for 13 years. 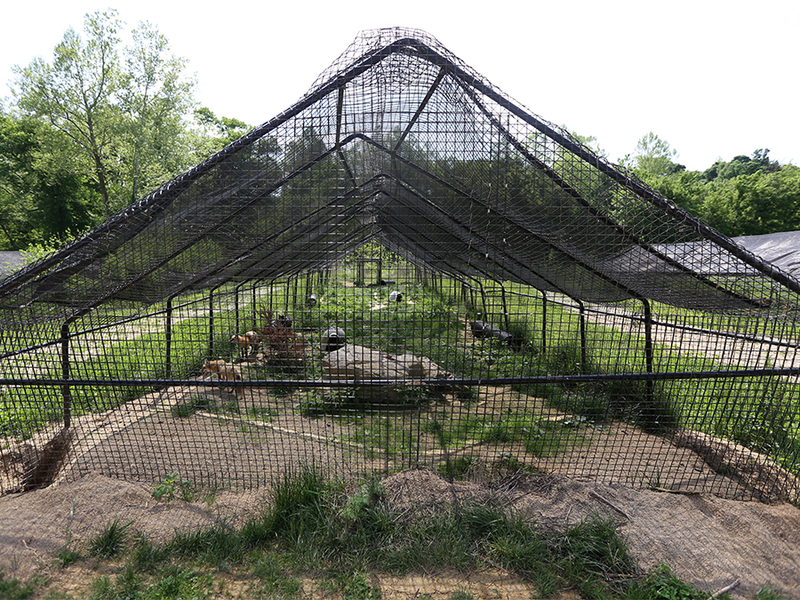 Over the decades, The Red Wolf Sanctuary expanded from a small farm in Dillsboro to a 450-acre property in Rising Sun. The first animal he rescued was a raccoon. Then came the wolves. Now his team cares for dogs, horses, bald eagles, hawks, elk, bobcats, bears, wolves, foxes and coyotes. He's on a mission to educate future generations about the importance of preserving habitats. "A lot of the things that were gone when I was a kid are now here because of habitat," Strasser says. "And that’s what we emphasize. Everyone can persevere, even in their backyards. Instead of mowing grass, plant trees. Make brush piles so animals can live in them. We can do a tremendous amount for local wildlife." After his time at the zoo, Strasser finished graduate school, then taught science at Summit Country Day for several years while working as a substitute in other schools. Now retired, the 67-year-old spends his days caring for his animals, their habitats and giving tours. "Since I taught sixth and seventh graders, I can torture a large group of kids at one time," he says with a smirk. And when the work slows down in the wintertime, Strasser wears a different hat: Santa's. Every year he grows out a full gray beard and long hair to play the role for a friend's pet photography business. Work days at the sanctuary are long. 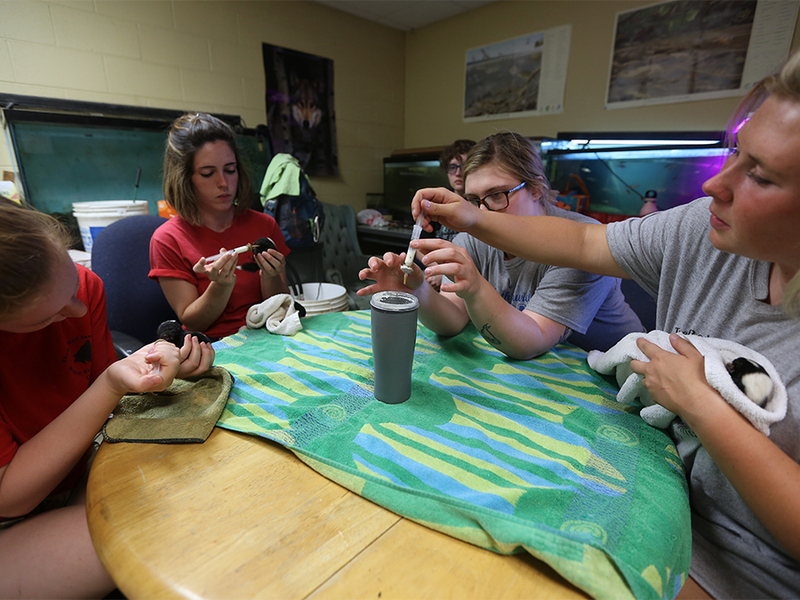 The team provides around-the-clock care for all its rehabilitation animals, as well the habitats they're preserving. There are no real days off for Strasser, who lives on the property. The nonprofit mostly sustains itself through donations -- especially food donations from the public -- and private tours. For Strasser, it beats working in a cubicle any day. "I think you're born to do something," he says. "And if you do it, you're happy. You may be poor, but you're happy. I think the problem is people don't listen to what they want to do." 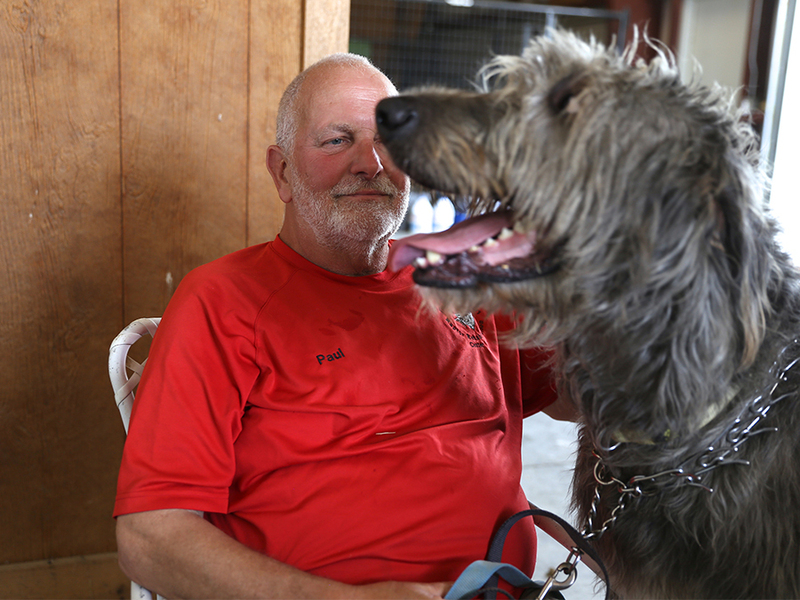 While animals are his life's work, after four decades, Strasser is hoping to slow down soon. His goal is to raise enough money to build an education center at the sanctuary in his mother's name, the Jean Martha Hennegan Environmental Education Center, where future generations can learn and work. Strasser gives interns and employees firsthand experience as a way of passing on his knowledge. On this humid Tuesday morning in May, he is teaching employees how to properly bottle feed baby skunks that the sanctuary has been caring for after their mother was hit by car. When asked what keeps him going these days, he responds with one word:"Ibuprofen." Admission to the sanctuary is by appointment only and must be set up ahead of time. Visit https://www.redwolf.org/ for more information or to contact the sanctuary for donation inquiries. Follow Wild Cincy adventures on Instagram @WildCincy and visual journalist Emily Maxwell on Twitter @EmilyWCPO .